Cristiano Ronaldo could be back at Old Trafford in the next summer, not exactly to play for Manchester United, but to participate in Rio Ferdinand's tribute game. The English center defender completes 10 years of serving the club and Ronaldo is said to be one of the most wanted guests at this friendly game, to be held in the Summer of 2012. Manchester United center defender, Rio Ferdinand, is close to complete 10 years at the English club and a tribute game will be held in the the Summer of 2012. Cristiano Ronaldo is a good friend of Ferdinand and there's a good chance that the Portuguese player accepts the invitation to honor his former teammate, by participating on this friendly match. The game will take place after the EURO 2012 and the final word about allowing Cristiano Ronaldo to make his return to Old Trafford, would necessarily have to be given by Real Madrid. 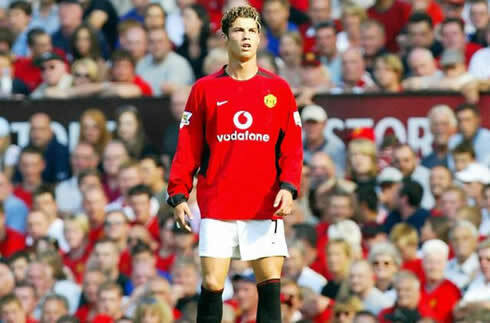 Do you remember Cristiano Ronaldo best moments in Manchester United? Rio Ferdinand was born in 1978 (he's now 33 years old), and started his football player professional career at West Ham United, in 1996. The English defender joined Leeds United in 2000, where he played until 2002, just before moving to Manchester United for a record breaking transfer fee at the time, at roughly 30 million pounds. While playing for the Red Devils, Rio Ferdinand has been involved in close to 250 games already and scored 6 goals so far. 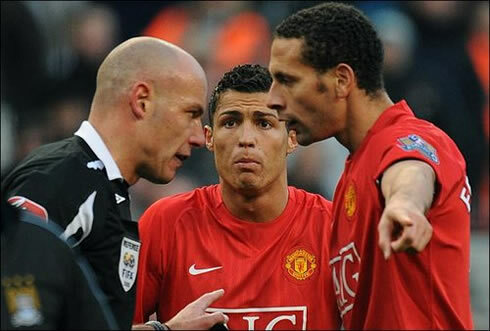 Cristiano Ronaldo joined Manchester United in 2003 and shared the locker room with Ferdinand for nearly 6 years, until he got transfered to Real Madrid, in 2009. However, it's still possible that Cristiano Ronaldo returns to Old Trafford before next summer, since both Real Madrid and Manchester United are leading their UEFA Champions League groups and could actually face each other in the knock-out stages in 2012. A match-up between two of the most popular football clubs in the World would however only be possible at the quarter-finals and further on. The reason behind that is that if the two clubs finish their group stage campaign in the 1st place, as it is expected, they will automatically avoid each other on the 1st knock-out stage draw, the last 16 round. When Cristiano Ronaldo left Manchester United to join Real Madrid in the Summer of 2009 for a world-record transfer free of 96 million euros, there has been a wide diversity of reactions from Manchester United and English fans. While some United supporters may still bear grudge against Cristiano Ronaldo, it's my personal belief that the majority of the supporters would grant Ronaldo with a well deserved ovation, if the Portuguese ever steps the Old Trafford pitch in the future. One thing is for sure: it will be a mix of a nostalgic and strange moment if we ever see Cristiano Ronaldo showing up in Old Trafford, in a Real Madrid number 7 jersey. Real Madrid next scheduled game is against Valencia, for La Liga, on the 19th of November 2011. Cristiano Ronaldo has joined the Portuguese National Team camp earlier this week, in order to prepare the 2-games playoff stage, against Bosnia Herzegovina. The first leg will be played in Bosnia, next Saturday, the 11th of November. The 2nd leg will be played in Lisbon, Portugal, in the 15h November of 2011. The winner will qualify for the EURO 2012.